When Oasis split in 2009, it wasn’t obvious which of the Gallagher brothers was going to forge a solo career if either. Noel was the primary songwriter and guitarist whilst younger brother Liam was the voice – the sound – of Oasis and it’s usually the lead singer who will break away and launch the solo career. In this case they both did but Noel did it first. 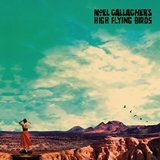 He set out in 2010 and the band name, Noel Gallagher’s High Flying Birds is really a pseudonym for Noel although he does have a regular touring band that comprises keyboard player Mike Rowe who has been with Noel since 2010 and ex-Zutons bass player Russell Pritchard who joined in 2011. The rest of the current line-up are former Oasis members Gem Archer on rhythm guitar and Chris Sharrock on drums. Earlier this year he added Jessica Greenfield who performs backing vocals and a little extra keyboard work. The name is taken from two sources, as he explained to Jonathan Ross, “The idea to prefix the name with Noel Gallagher’s was formed whilst I was washing up dishes listening to the album Peter Green’s Fleetwood Mac and the Flying Birds is taken from the song High Flying Bird by Jefferson Airplane. His eponymous debut album arrived in 2011 and made number one spending just over a year on the chart thus proving Noel’s popularity. The debut single, The Death of You and Me reached number 15 which was followed a couple of months later with Aka What a Life which made number 20. His next album Chasing Yesterday arrived four years later and also topped the UK album chart and from it the hit singles were In the Heat of the Moment and Ballad of the Mighty I which featured Johnny Marr. This year saw the arrival of his third album Who Built the Moon? The single was available for download, stream and on a physical 12″ picture disc single and entered the chart in October but stalled, surprisingly, at a lowly number 69. The album was released one month later and crashed in at the top of the chart. The 12″ version came with an instrumental version of the song and the additional track Dead in the Water (Live at RTÉ 2FM Studios, Dublin) which is a song that Gallagher and Rowe recorded ad hoc whilst visiting a radio station in Dublin. Noel’s brother Liam, unsurprisingly, wasn’t particularly complimentary about his brothers new material, he said in an interview with NME, “Musically, I find it a bit annoying,” adding “I think there are too many notes in it, and it’s just a bit not risky. It’s not for me.” No, it wouldn’t be!